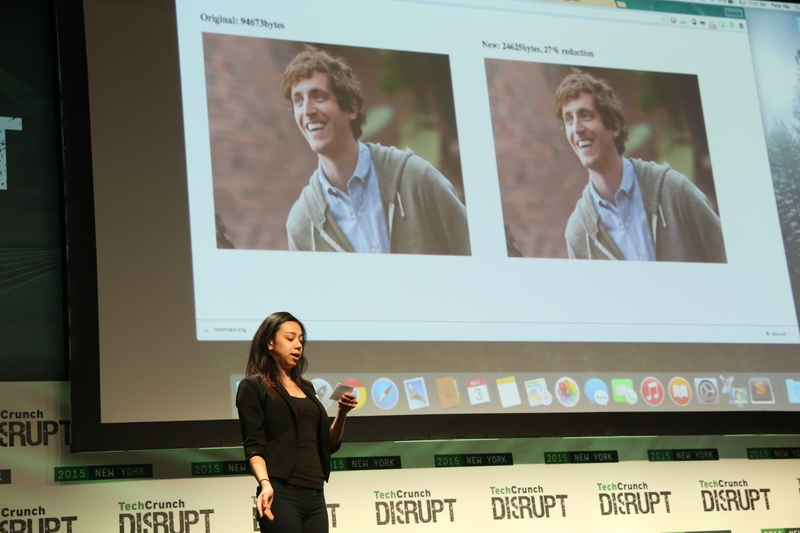 Brother and sister team Peter Ma and Nancy Ghaly presented Piper Pied, a lossless compression algorithm for online images, at the Disrupt NY Hackathon today. The startup is a “creative spin” on Pied Piper, the company with a similar lossless compression algorithm for everything that appears in HBO’s Silicon Valley, according to Ghaly. The idea came from a conversation the sibling team had in Ma’s car on the way to Disrupt. “We were just talking about shows we watch and ideas for the Hackathon and Nancy kept saying ‘what about Pied Piper, what about that? Is that possible?’ Then I was like ‘you know that’s not too bad,'” said Ma, who makes his living as a rapid prototype consultant in the Bay Area. Ma and Ghaly, both super fans of the HBO show, then spent the next 24-hours joking about this “crazy” idea and building a version of a lossless compression program that would identify people’s faces. “The algorithm detects the face and then from there it can compress everything else but the face so that you keep the quality of the face while technically lowering the quality in a way that is not noticeable to the human eye,” Ma said. This ensures the main focus of the image remains at a high quality, while simultaneously reducing data. As the show – and Ma – point out, we are at a point in time where reducing data is about to become very important. Data is cheap to store and send in the United States, but expensive in many other parts of the world. As images become higher in quality, we’ll need ways to easily transfer and store those larger files of memory. This is not the duo’s first hackathon. The two entered and won the grand prize of $54,000 at the AT&T Developer Summit earlier this year for an app that detected drowsy drivers on the road called Anti Snoozer. When I asked the two what they thought of their chances with Hooli/Google taking over Piper Pied, Ghaly replied that we’ll just have to follow the show. In any case, you can compress your own images using the Piper Pied algorithm by clicking here.